Puerto Rico was a gift from my parents. I've already played it twice, and I know I should wait for more plays to rate it, but it's already a definite 10 on my list. I've just loved both times I've played it. Perhaps it has something to do with the fact that I won both (one was a 4-player and the other was a 3-player game), which is really significant because my winning percentage at most Eurogames is very low, even though I like them more than anyone else I know. I don't mind losing at all, I've gotten used to it, but am alright at this game. Regardless, it's just an amazing game. 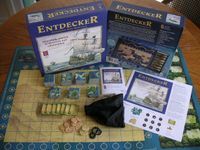 Entdecker was the second board game that my parents got for me. I haven't played with other people yet, but did play through an entire game by myself, using three different colors. It seemed pretty good, nothing like Puerto Rico, but a nice tile-laying exploration game by good ol' Klaus. I was surprised by how significant the native good hut thingys mattered in the end, kind of like the aristocrats in St. Petersburg in a way, both caught me off guard as to their impact on the final score. 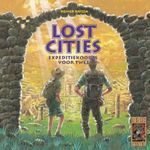 Lost Cities was a gift from my younger brother. I've already played it 5 times and it's definitely a great 2-player card game (by the way, the reason I probably love most of the games I got is because I spent hours and hours trying to research what was good and what was not, I have a much better percentage of games I like now that I've found BGG, thanks). Anyway, now I'm not sure I'll go back to Balloon Cup, maybe eventually, but this is a far superior 2-player card game in my opinion. Amun-Re was a gift from my older brother. It just came yesterday, so I haven't actually played it yet. But did punch out the pieces and it looks very good. 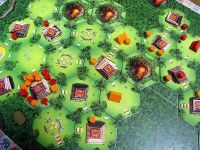 I'm becoming more and more of a fan of Dr. Knizia lately. If it's by him, I really don't doubt I'll enjoy it. Metro was the second board game that my older brother got for me. Actually played it once last night after the package arrived, in a 3-player game, and it was a pretty fun, light, tile-layer. Quicker than Carcassonne (becuase I have 5 Carc. expansions) and different enough to be worth it. I didn't do so well, but next time, well maybe not, but I'll give it a go. Tigris & Euphrates was a gift from my girlfriend, and it was awesome, at least the one time I've played it so far. Played a 3-player game, and I actually won, which was a plus. I really, really want to play this again and again and again, I can just tell that the more I play this one, the better it will get. 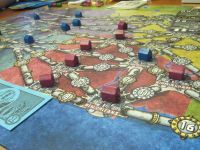 Princes of Florence was the second board game from my girlfriend. Played this once so far in a 3-player game and it was very enjoyable. Went a bit slow, especially becuase of the whole draw 5 cards and pick one thing, but I imagine that'll get better when we've played multiple times and don't have to read all 5 cards really closely, whether they're Bonus or Prestige or Profession cards. Anyway, having enjoyed both Alea games I got a lot, I'm putting Ra and Taj Mahal and Traders of Genoa way up there on my list. Citadels was the third board game gift from my girlfriend, and I've played it twice so far. 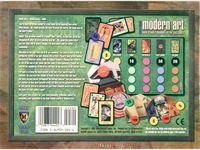 I really like this as a multiplayer card-game, it may rival Bohnanza, an old favorite, as my favorite multiplayer card-game, although they're obviously very, very different. I came in third out of four in the first game and won the second game. I have a particularly strong affinity to the Architect, but that makes me liable to get assassinated and stolen from, so I need to mix it up a bit. 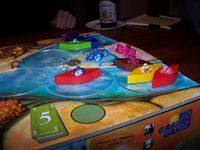 Niagara was the fourth game from my girlfriend (I know, she's awesome, and there's even a fifth coming up next)! I've played this twice so far, and did terribly both times, coming in dead last, but nonetheless I really enjoyed it. I felt like a complete idiot the first time my boat went over, but then everyone else lost boats when the river got going fast. One turn it had to move seven spaces because the weather was at +2 and that was the best turn yet, hehe. St. Petersburg was the fifth and final game that my girlfriend got for me. It's simply awesome! I've played it three times so far, and I really really like it a lot. All three plays were 2-player games. I lost one and won the other two. Wow, aristocrats really matter at the end, the winner every time has been the person with the most unique aristocrats. It also seems important to get a lot of one or two kinds of workers early, so they get really cheap. Like the Lumberjack or Gold Miner especially. I want to try it with 3 or 4 players some time, but it's definitely an awesome 2-player game. Torres was a gift I got for myself because it wasn't available until after I'd given out my birthday wishlist to everyone. I've been waiting for it for months because it looks like one I'll really enjoy, so I just ordered it as a birthday gift for myself. It's still in the mail, I'm eagerly checking every day. I had to get to free shipping on Fair Play Games (TH didn't have Samurai in stock, so I had to go to $125 instead of only $100, oh well, the more games the merrier, and the poorer), to save money of course! So I ordered Tikal as a present for myself as well. Another game I'd been waiting for for a long time and which wasn't available until after the birthday wishlists went out. Samurai was the third game I got for myself. I normally look for games that won an award, not necessarily SdJ, perhaps the DSP or the IGA, and this one wasn't very highly recognized, but it's talked about so much on here that I just had to have it. Plus, as you've noticed I ordered a lot of games that work with 2 players because I often only have 2, and games that I got from others tend to need 3, like PR or PoF or Niagara. Looks great, I can't wait! Power Grid was the #1 game on my entire wishlist for my birthday, but the signals must've gotten crossed because no one got it for me, anyway, no worries, I got it for myself, which works out better because it's one I'd definitely buy for myself, and some of the gifts I might not have, so more games, yay. I'm really really looking forward to this, from what I've read, it sounds incredible. I had to order the Puerto Rico Expansion for myself, not because I'll use it right away, I'll definitely wait until we've played PR a bunch more, but for later, I want to have it. I had to get to $125, so this was the trick. I wanted something that wouldn't push me much past $125, so it was either this or LOTR: Confrontation, and I decided somewhat randomly. This looks great, sounds great, I'll give it a try. Oh, and I also ordered two more games using the budget for my club that I've formed at Columbia Law School. Yeah, I formed the Columbia Strategic Simulation Society (based on a club I used to be a member of at Cornell) and they actually funded me. They gave me $250 for the first year, which I used to buy food, along with New England and Alhambra. I use the funding to buy games I'm not sure about, but want to try. Turns out I love New England and Alhambra, and am also loving Oasis. Ordered it with the $140 the school gave me to host a 1L Orientation event next month. You can find the link to the club's website in my profile. Anyway, have played Oasis twice so far. Y'know, gotta' learn how to play it so I can teach the 1L's. Although I'll probably start them on Ticket to Ride or Carcassonne. 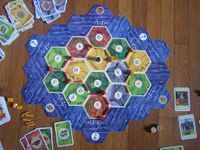 Last but not least I ordered Settlers of Catan with the club's funding (the CSSS) because I got Cities and Knights and Seafarers back in May, and I only own the old brown box Mayfair edition of Settlers, and it doesn't work well with the two expansions because of the color of the pieces (the old ones were white, black, purple, and orange, not blue, orange, white, and red, like the new ones. Plus, the tile art is different and makes your brain hurt if you mix them. Plus, the club has to own it's own copy of SoC. Since getting this, I've played Seafarers and Cities & Knights a couple times separately, not together yet, and they're both great additions.